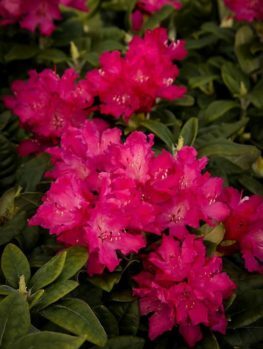 This classic Pink Rhododendron, English Roseum, is a larger shrub, perfect for background planting and filling areas beneath deciduous trees. Plant it on the eastern side of your home, sheltered from afternoon sun. A broad, evergreen bush with large oval leaves, it will be smothered every spring in huge domes of beautiful lilac-pink blossoms that add a touch of elegance and vibrant color to any garden. It blooms in the middle of spring, avoiding damage from late frosts. 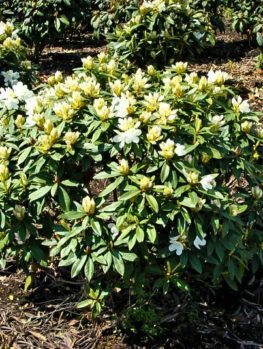 This beautiful plant is also more tolerant of both humidity and heat as well as colder conditions, than almost any other variety of rhododendron. Its flowers make a brilliant display in the garden, standing out like a glorious beacon beneath the trees. 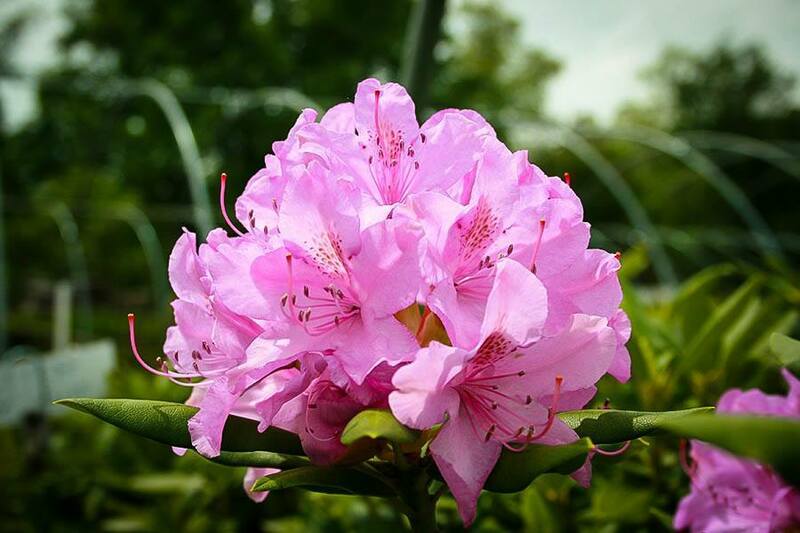 Use the Pink Rhododendron English Roseum massed beneath trees, bordering the foundations of your home or in other locations around your garden that may not get a lot of sun. It grows best in acidic soil, but if you do not have those conditions, you can feed it twice a year with chelated iron, and fertilizer for acid-loving plants. Or it can be grown in a large pot, using soil designed for acid-loving plants. It has no particular pests or diseases, and deer usually leave it alone. This classic variety remains one of the very best flowering shrubs you can grow in your garden. 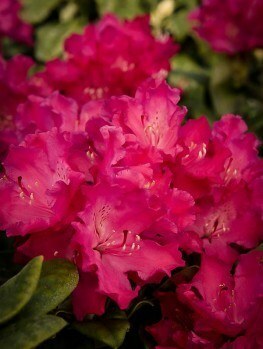 Rhododendrons are the kings of the spring garden, with their enormous trusses of bright flowers lightening up shady parts of the garden or glowing beneath tall trees. They do have some needs, but if these are satisfied they are easy to grow, long-lived and satisfying plants, reliably bringing us a spectacular display every spring. Among the easiest to grow and most reliable of the large-flowering rhododendrons is an older, ‘tested and true’ variety called English Roseum. This tough variety is hardier than most, growing equally well in cold areas and hot areas that would defeat many other types. This makes it a top pick for the home gardener, who wants beauty plus easy growth. 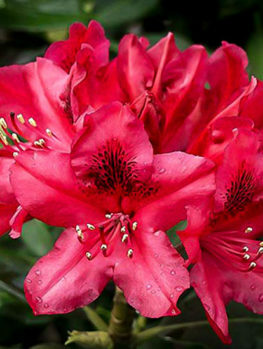 At the Tree Center our goal is to make gardening easier and more fun, so we have chosen to highlight this variety – one of the most reliable varieties, and a first pick for anyone who loves rhododendrons. 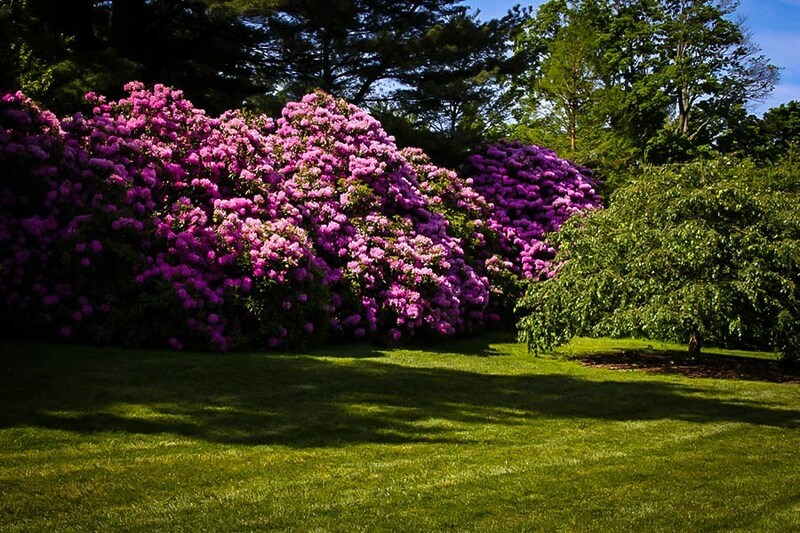 The pink rhododendron, English Roseum grows steadily into a large bush, reaching 4 feet and eventually as much as 10 feet tall. It is wide-spreading, always a foot or two wider than it is tall. The foliage is impressive. The leathery evergreen leaves are up to 6 inches long, oval in outline, with a smooth surface. They radiate out around the stems, and even when not in flower this is a striking shrub. In winter you will see the large flower buds at the ends of the branches, and in spring these open into huge trusses of flowers, with about twenty blooms opening in each head, which has a rounded form. The individual flowers are trumpet shaped, flaring open, and colored a lovely lilac-rose. At the base of the upper petals is a cluster of dark spots, and the parts of the flower protrude in elegant curves. The overall effect is one of abundance, grace and power. The English Roseum Rhododendron is among the hardiest of all the rhododendrons. It grows and blooms reliably in zone 4, where winter lows can reach minus 30. Yet it grows just as well in hot, humid areas, all the way through zone 8. You can grow this plant with confidence in your garden, across almost all the country. 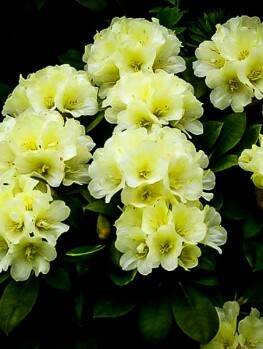 Use it for the background behind other shrubs that flower at different times of the year. 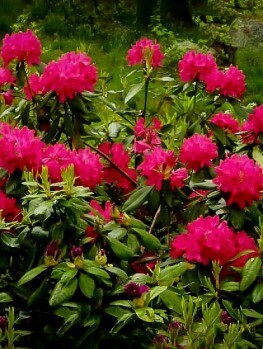 Plant it among acid-loving plants like azalea and camellia in a woodland garden. Use it in beds on the east side of your home, sheltered from the afternoon sun. Wherever you grow this plant in your garden, it will be a big hit, blooming profusely and creating a spectacular showing. Plant English Roseum in a partially shaded spot, protected especially from hot afternoon sun. Beneath deciduous trees is an ideal environment, and close to the conditions where these plants naturally grow. The soil should be acidic, although if you do not have suitable soil you can use ‘chelated iron’ to grow them, or plant in a large pot, with soil blended for acid-loving plants. Moisture is important, and the best soil will be well-drained, but rich in organic material and damp but not wet. Regular watering is especially important for young plants, and if you see the leaves drooping downwards in older, established plants, immediately soak them thoroughly. The root system is shallow, so use lime-free organic mulch to conserve moisture and provide nutrients. This plant has no significant pests or diseases, and it is usually not eaten by deer, so if you can provide suitable soil conditions, it is very easy to grow. 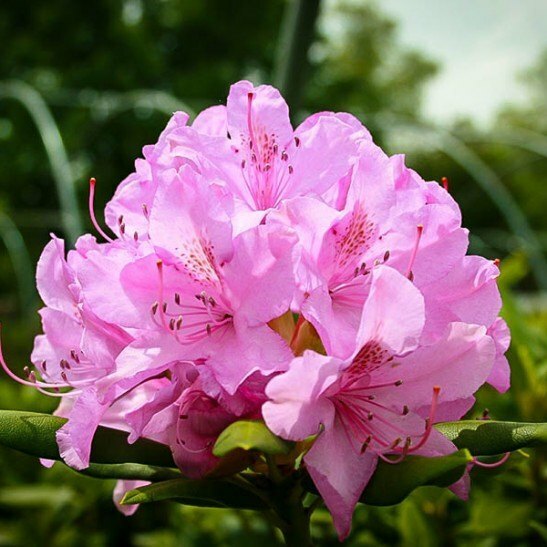 The Pink Rhododendron English Roseum has an interesting heritage. English gardeners have always been fascinated by rhododendrons, and as early as the late 18th century they were growing and breeding species that grew to the east of Europe, such as Rhododendron ponticum. By the beginning of the 19th century they had North American species, particularly Rhododendron maximum, and Rhododendron catawbiense to work with too. These plants grow wild on the mountains of the south-east, and they are much more cold-hardy than other forms. An English nurseryman called Michael Waterer, and his family, used these plants, breeding them with R. ponticum, to produce attractive hybrids. 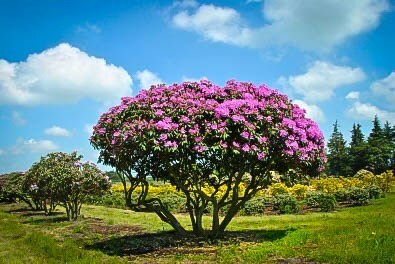 The soil at the Waterer’s nursery in Knap Hill was very like South Carolina, so the American rhododendrons grew well. Among the plants bred there in the 19th century was one called ‘Roseum Elegans’, and from it was bred a superior plant called ‘English Roseum’. This plant was brought back to America, where it proved to be incredibly hardy and reliable. Today it is still considered a first-choice plant for easy growing. Our plants are produced from pieces taken in direct line from that original plant, so you know you are getting the best. It always pays to choose named varieties of these plants, to guarantee top quality. 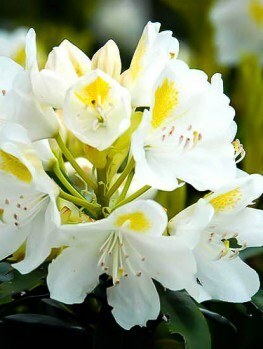 Our customers love rhododendrons, and this is a popular-selling variety, especially in colder parts of the country. We will not have our stock in long, so order now before we are completely sold out! 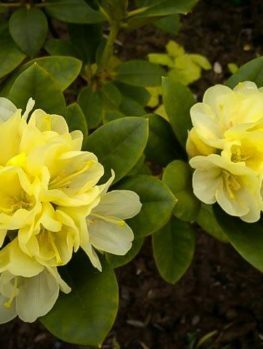 You may also want to consider other popular varieties like the Helikki Red Rhododendron and the Lemon Ice Rhododendron, to add more color to your garden.